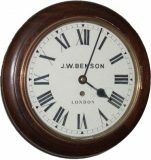 Vienna wall clock made by the Kienzle clock company in Germany. Spring driven 8 day movement striking a spiral gong on the hours and half hour. Carved walnut case with eagle pediment and finials. Gridiron pendulum and brass pendulum bob. 7″ dial with Roman numerals. Fully restored with one years guarantee. Ref: g0720.